Home / Adventure / Events / Aero India 2015: Breitling Wingwalkers :Stunt show on the plane wings! 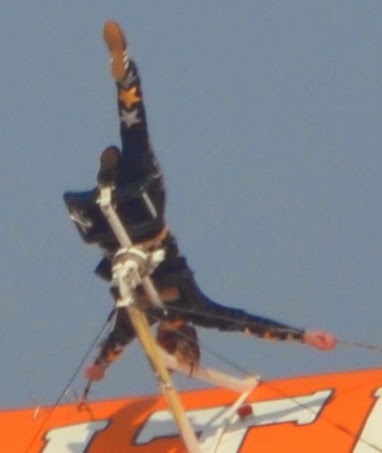 Aero India 2015: Breitling Wingwalkers :Stunt show on the plane wings! One of the main attractions of Aero India 2015 compared to previous edition was the stunts performed on a flying aircrafts. There were two teams performing live stunts standing on the wings of a mini plane. One of them were Breitling Wingwalkers. Some photos on Breitling Wingwalkers at Aero India 2015, below before I write further. Below are some close up shots of the Breitling ladies in action. They seem to be supported by a structure mounted on the wing of the plane, which serves as a seat/harness while performing various stunts. At times they were upside down too. Their planes cruise at up to 160 kmph in their 1930s Boing Stearman planes. From the ground, it is very difficult to see what these ladies are performing up in the air on top of plane. Most will only see the plane. Except some few moments when the plane comes closer to earth/people where it is possible to get a bit closer look. Note that Breitling is a popular and expensive switch watch brand, ads of which you see in flashy magazines. Awesome photos of the super wingwalkers. Ooh!! This time there were people doing stunts in the air? Thank you for sharing those pictures, Shrinidhi. Awesome shots ! Loved them all. You used a 70 -300 mm ? The photographs has come so sharp!